Beverly Middle School Homeward Bound: THURSDAY @ 4pm - It's Game Time! Thursday at 4pm, the 8th grade students take on BMS staff in what is sure to be 4 quarters of the finest basketball you’ve ever seen! While you cheer for your favorite player, you can dance to tunes from our DJ, enjoy a snack from the concession stand, and possibly win a raffle basket! This fundraiser for 8th grade end-of-year events is $5 for students/$10 for parents. Concession items are $1, and raffle tickets are just 50 cents! Doors open at 3:30 and game time is 4pm. Please park in the back of the building and enter by the gymnasium. ALL Beverly Middle School families are welcome. We hope to see you there! 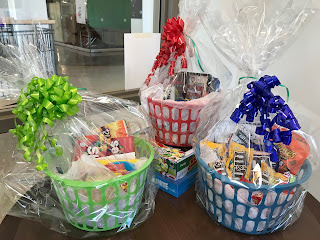 We have three baskets to raffle off at our basketball game. Basket #3 includes movies and, wait for it, candy!